Social Etiquette Crimes: Are You a Kloutbragger? Increasingly, online services act like roach motels: They make it easy to check in, but nearly impossible to check out. By hiding their opt-out pages deep within their settings menus, by using deliberately confusing graphic design, and by presenting emotional appeals that declare how much the site will "miss you," these services make the simple process of deactivating your account a complicated trial. To give you a sense of the hurdles you can expect to face the next time an online service doesn't want you to leave, we've picked out five services that make quitting needlessly difficult. Facebook makes a blatant appeal to your emotions. You're not deactivating your account, you're deactivating your friendships! Facebook is the quintessential clingy service when quitting time rolls around. The social network tries every trick in the book to keep you on board; just finding the setting to shut down your account can be challenging. (It's located under 'Security Settings'--which is obviously the first place any rational human being would think to look.) And once you do try to quit, Facebook attempts to guilt you into staying by showing you pictures of all of your friends and telling you that they'll miss you. Even if you manage to survive the guilt trip and confirm two separate times that you want to shut down your account, you're not safe: Your account may not be active, but Facebook still has access to all your data. 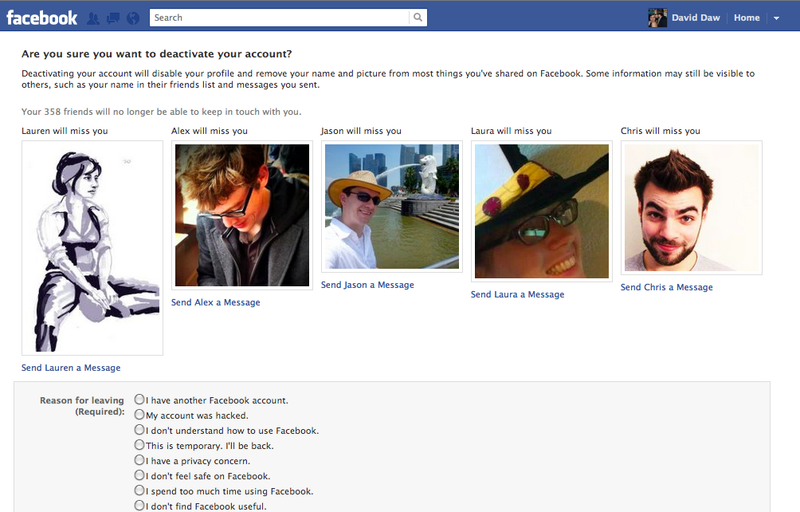 Deleting your Facebook data requires a totally different, and much more labor-intensive, process. As bad as Facebook can be, services that you pay money for really ratchet up the guilt trips when you try to leave. I considered including World of Warcraft's famously byzantine account deactivation page in this list, but Bioware's new Star Wars online game recently topped it. The Old Republic is an intense story-driven game that sees you working closely with several AI-controlled non-player characters who are unique to your story. 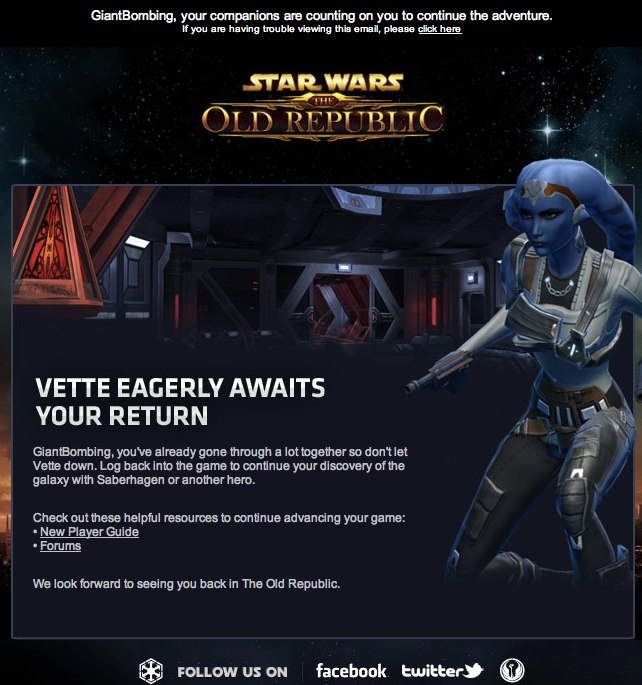 During the weeks it takes you to level up in The Old Republic, you'll spend hours speaking with these characters and getting to know what makes them tick, which makes it weirdly affecting when Bioware tries to keep you from quitting by telling you how much these fictional characters will miss you. While it is certainly an original ploy, it doesn't seem to be working too well: EA just announced in a recent earnings report (PDF) that The Old Republic has lost a quarter of its total subscribers since March. The option to end Apple Newsstand subscriptions is buried in the Manage App Subscriptions menu of the App Store. I can think of a lot of great things about Apple's iTunes and App Store, but their archaic payment system isn't one of them. The constant need to approve new end-user license agreements and confirm your payment data is annoying enough when you try to give them money, but Apple's Newsstand service added a bunch of new hoops that you have to jump through if you want to stop paying. 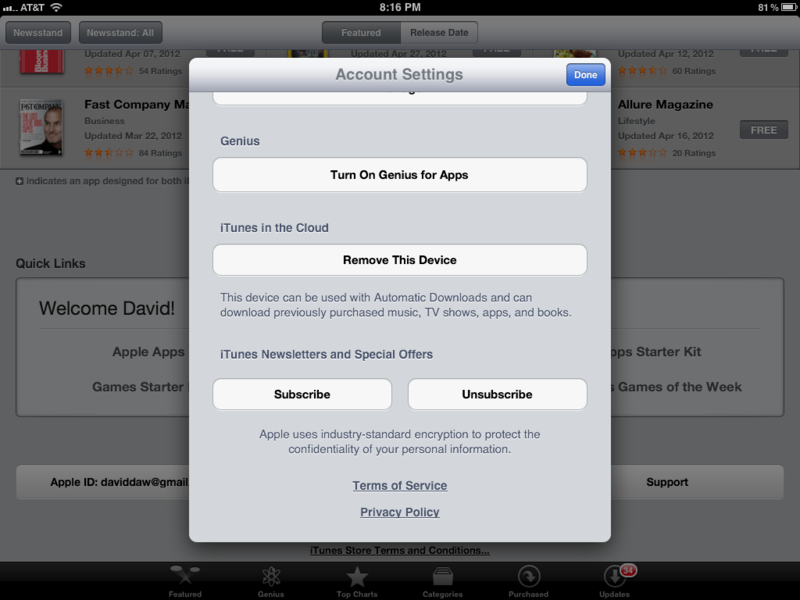 If you sign up for a newsstand subscription and later decide that you don't want it anymore, you need to dig deep into the belly of the App Store app on your iPhone, iPod Touch, or iPad: After confirming your Apple ID to get into the Manage App Subscriptions page, you navigate to the specific page for the particular subscription you're looking to unsubscribe from, choose a subscription category, toggle it off, and confirm your choice. It isn't the most annoying process on the Web (Facebook has that covered), but considering that it comes from a company that prides itself on ease of use, the Apple Newsstand is anything but easy to use. 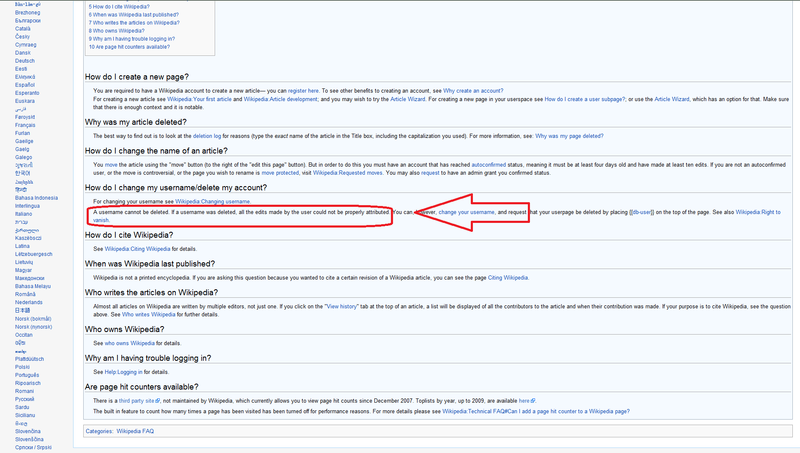 Wikipedia accounts can't be deleted; the best you can do is change your name and request that your personal user page be deleted. Wikipedia isn't nearly as insidious as the other services on this list. The crowdsourced encyclopedia is one of the largest free information databases in the world, and it asks nothing of its users but their time. Despite our love of Wikipedia, however, we have to note that deleting a Wikipedia account once you've created it is completely impossible; even changing your name on Wikipedia is a lengthy process. The site has structural reasons for this restriction: Allowing you to delete your account would leave articles and edits orphaned (which would make vandalism even more common), but it's still bizarre that one of the Web's greatest open projects is also the hardest to quit. Opting out of Klout is time-consuming, but it can be done. Don't think you have a Klout account? Think again! Klout is a fairly new service that scans your Facebook and Twitter accounts and determines your social influence, then expresses it as a metric known as your "Klout score." The exact algorithms by which it determines your Klout score aren't public knowledge, but the score is starting to have real influence in the tech world. The bizarre thing about opting out of Klout is that even if you've never heard of the service before, you've probably been assigned a Klout score. That's because Klout has generated Klout scores for more than 100 million people based on their publicly available Twitter updates, so if you choose to broadcast publicly there's a good chance the Klout algorithms have judged you accordingly. 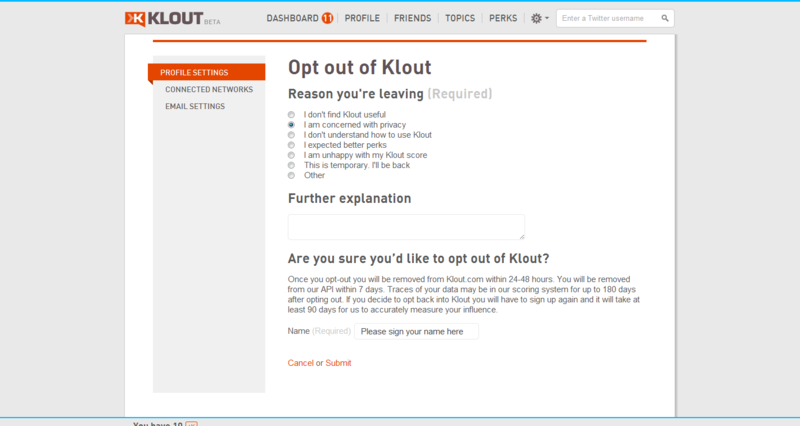 This setup isn't a huge invasion of privacy so much as an added inconvenience if you refuse to play along; if you prefer to have your Klout account removed or your Klout score deleted, you can head over to Klout's opt-out page and confirm a few times that you really want the site to delete your info. Of course, no matter how many roadblocks a service puts in your path, if you're determined you can step away--albeit more annoyed than you need to be. In the end, the online service that's truly the hardest to quit is the one you don't want to leave. It's too bad that more service providers don't take this idea to heart when trying to retain the goodwill and patronage of their users.